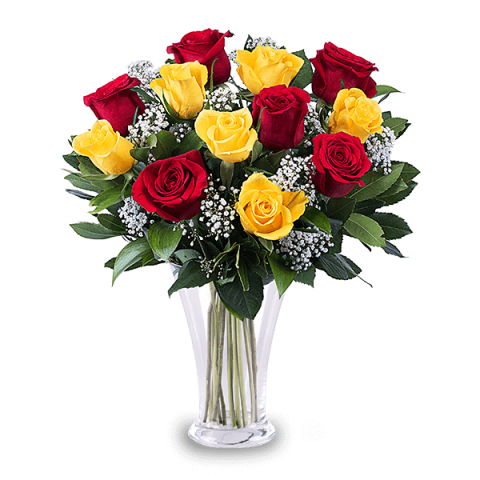 Surprise with 12 red and yellow roses adorned with fresh greenery delivered to a loved one's door worldwide. Make a rose bouquet delivery with FloraQueen today to over 100 countries with 7 days freshness guaranteed. Make a yellow flower delivery today to make someone smile and impress those you love with the most beautiful yellow coloured bouquets. FloraQueen’s international flower delivery service makes sending the most beautiful yellow bouquets easier than ever before. Yellow flowers are full of joy and significance, meaning amongst other things: friendship, affection and hope. There’s no more positive surprise than a beautiful yellow bouquet of lilies, or a selection of yellow and red roses on someone’s birthday. They also carry a serene and calming message making them ideal flowers to remember the life of a dearly departed relative or to wish someone well on the road to recovery. What are the best yellow flowers? You’ll find many of these beautiful blooms and more in our online flower collection, arranged into spectacular bouquets, just bursting with joy and emotion. A yellow bouquet or one arranged with a mix of yellow flowers and other colours will surely delight someone special when it arrives to their door. Standard Delivery: Your order will be prepared in our own bouquet creation centres by our master florists and will be shipped by courier in our exclusive branded box. Special Delivery: If your order is outside the range of our bouquet creation centres and is more last minute or during the weekend* then we’ll entrust your delivery to one of our network of expert local florists. Your bouquet will be hand-prepared by a trusted florist and delivered with care to your special someone’s door.